Heroku is an awesome no-fuss hosting service for rails applications (I think I've raved about it enough). It works great for solo development. But what if you want a large team work on the app, while limiting production deployment privileges? Or if you want the application to run as an open source project? $ git commit -m "initial check-in"
At this point, you are setup to work locally and also collaborate with other's via github. If you have a paid account on github, you can make this a private/secure collaboration, otherwise it will be open to all. Writing objects: 100% (17/17), 2.17 KiB, done. So we are done! 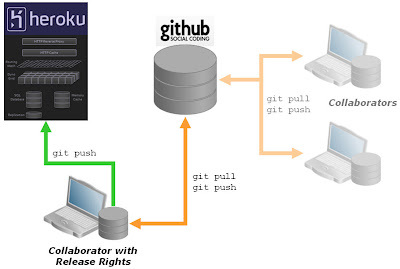 I can push/pull from the remote "github" to update the master source collection, and I can push/pull to the remote "heroku" to control what is deployed in production. PS: Once you are comfortable with this, you might want to get a bit more sophisticated with branching between environments. Thomas Balthazar's "Deploying multiple environments on Heroku (while still hosting code on Github)" is a good post to help.